MAXIMUM ORDER ON THIS ITEM IS 2 CARTRIDGES. 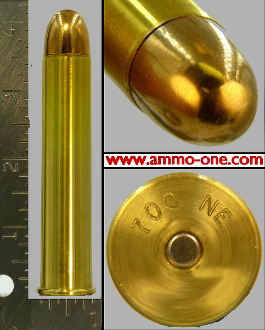 Please Note: This is, new live ammunition, using new brass cases, and custom loaded for ammo-one1.com. One Cartridge, not a box: 700 Nitro Express, LIVE custom loaded, using new 3&1/2" long brass cases with a “700 Nitro” Head-Stamp and Woodleigh 1,000 grain FMJ projectile. Please note: This item is listed in British and American Rifle sections as it was designed and produced in the USA for Holland & Holland a British company. History of the .700 Nitro Express Cartridge:The 700 Nitro Express is a completely new design and not based on any other caliber. Many believe the 700 Nitro Express is a British invention; however, it was developed by two Americans; Jim Bell and William Feldstein and the Eldorado Cartridge Corporation in the mid to late 1980s. To make a long story short, Holland & Holland Firearms Company of England refused to make Mr. Feldstein a 600 Nitro rifle as they had completed that series, so Mr. Bell and Mr. Feldstein asked Holland & Holland to builda new rifle designed for (their invention) the new 700 Nitro Express. To date, only a very few rifles have been produced for the 700 Nitro Express, as with a 1,000 grain projectile traveling at 2,000 feet per second, the energy is almost 9,000 foot pounds. Most of the cartridge production is for cartridge collectors as the 700 Nitro Express is more like a small artillery round than a rifle cartridge and the rifle is appx. $200,000.00 or more. This is the largest commercially made cartridge currently available to the general public (that I am aware of) to date.